It was an unfortunate accident and if only time could be turn back, maybe this jeepney driver would do the safest action he must do to avoid the accident. It was late in the evening and we are still in Camp Mariano where the 3rd LA Regional Conference had just finish when a loud noise woke us up. I was woken up not by the noise but by the grumbling of people outside our tent. An unfortunate accident happened. Luckily no one was injured but some parts of vehicles had been damaged. It was a sloped area and the jeepney descended when the engine was still off. The driver could not control it anymore that it bump to a van and a toyota hilux. 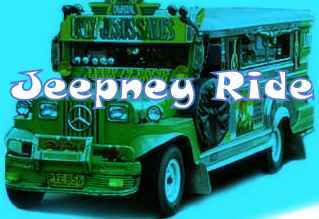 The jeepney was rented as well as the van. The toyota hilux was a company car and it was not a company business transaction that the driver was in great dilemma as well. They are hesitant to report it because the driver of the toyota hilux might loss his job if they do so. If they will not report the accident the insurance company will not shoulder the expenses. Aside from the toyota hilux, the van also need major repairs because the sliding door could not be opened anymore. I pity the jeepney driver for being in this situation. He was already teary-eyed when he was telling the whole story. I don't know how they will resolved this.